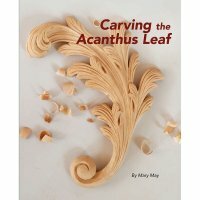 The book about how to carve the acanthus leaf, a cornerstone of Western ornamentation for thousands of years. The author explores carving tools and sharpening with the efficiency of someone who has taught for years. Then she plunges the reader directly into the work, through 13 progressive variations of leaves, from the simple one up to the highly ornate Renaissance and Rococo forms.